I learnt Gantt Chart for a couple of times. First from Economic and Management class, then from Engineering management class. Gantt Chart plays a crucial part in efficiency, based on a combination of clear classification and evolving progress display. Moreover, Gantt Chart comes first when it comes to visualization. 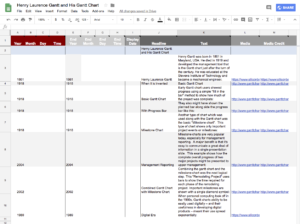 This leads to this short report of how I developed a timeline of Gantt Chart. 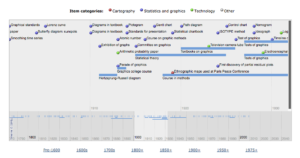 Pick a topic on Milestones of Data Visualization. I chose Gantt Chart. 3. From the homepage I could find dates and evolving charts. 4. Use the template from TimelineJS, input dates, headings and descriptions. 5. Input links of images and resources, choose backgrounds and colors. I did a first project of History of Chinese Architecture and it is not related to data visualization so I stopped. 2. Gantt Chart is pivotal, the Milestones where we found topics is a Gantt Chart Milestone itself. 3. Proper tools accelerates the process of creating a visualization. Thanks to this program and the author who created the tool. 4. The classic application of tools is fundamental to creating fresh new reports in the future. 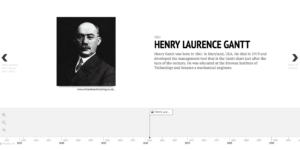 The post Henry Laurence Gantt and His Gantt Chart appeared first on Information Visualization.